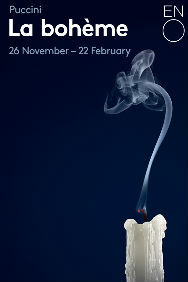 Puccini's opera La Boheme at English National Opera (ENO), Coliseum, in London. Tickets for La Boheme in London can be booked here! Puccini's gift for writing emotional music is brought to the fore in La Bohème's tale of doomed love in poverty-stricken Paris. One of the world's most recognized and widely performed operas, it focuses on two central relationships: that of the poet Rodolfo, who falls in love with the pretty but consumptive seamstress Mimì; and the painter Marcello, who has a glamorous and popular on-off mistress, Musetta. ENO is known for it's radical inventiveness. Jonathan Miller's production of La Bomème for ENO has quickly become a company classic, a production that has been slightly modernized and takes it place it the 1930ths. La Bohème receives its second revival at English National Opera since its 2009 premiere.